Today would see the Monsoon really go down a notch due to unfavourable westerly winds and High Pressure Placement pretty much overhead. 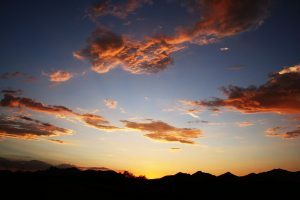 The only chances of storms would be over the Mountains south and east of Tucson and even then the storms would be very patchy and not last long. 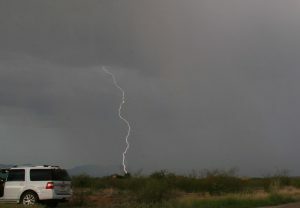 We ambled down to get South of Tucson for around 6pm and watched very shallow cumulus and looking at the radar data not a single Lightning Strike in the state of Arizona. Would we break our 5/5 days of Lightning and Storms today. I pushed us further South to Sonoita and could see some lightning activity picking up into Mexico about 50 miles to our south and also some nice developments near Tombstone. 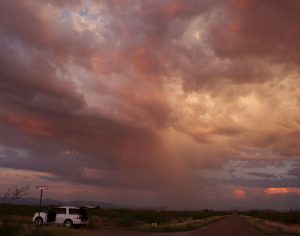 We headed west to Whetstone and a very small monsoon storm erupted about 10 miles from us just as Sunset had begun. The Storm was only about 10 minutes into its lifespan so I knew it should put out a few more bolts and sure enough I managed to capture one before the storm died out as darkness fell. After this we headed back west and shot the Milky Way for a bit before all storm action died off.